I’ve only been home from my study abroad experience for a few days, so I know that adjusting back to life in Seattle takes some time, but it definitely has been challenging, more emotionally than anything. My sleep schedule is off, so I find myself wanting to nod off in the afternoons, which means I wake up in the early morning hours and have to find creative ways to fill my time. I’ve also been experiencing some sadness and depression around being home, and feel a bit disoriented and unsure of what to do with my time. While in Italy I was so focused on other people and helping to contribute to the bigger picture, but now that I am home I have to focus on my own life, deal with things I’ve been putting off, and begin pursuing my deep passions and interests. Aside from the issues I face personally, I miss the friends and connections I made in Alghero, Sardinia, the warm and sunny weather, and the vast number of stars visible in the night sky when you’re walking along the beach. I miss the walking around and exploring, finding new restaurants, and enjoying panoramic views from hotel rooftops. I miss staying out until 4am because we’re all having so much fun socializing and dancing with our new friends, and I miss the hospitality that we were shown from locals and the community members we worked with. As part of our curriculum, we touched on topics such as white privilege, marginalization, and issues facing migrant and refugee populations. Being born and living in America was a lucky chance, one that many do not get to experience. This has been an internal struggle of mine, especially since I’ve been back home, as I am constantly reminded of the luxuries around me. I’m finding it hard to enjoy things at times, as I will begin to feel guilty about these luxuries when I know that others are just trying to survive with much less. We have more opportunities and resources here in America, and it can be a hard reality to sit with, but in one of our reflection letter assignments while abroad I brought up the fact that all I can really do is acknowledge my privilege honestly and vow to use that privilege in order to help others. Something else that I’ve realized and accepted is that nobody really wants handouts and nobody wants to be pitied. I say this because there were times throughout my trip where I felt bad for those we were working with and their situations, but I realized that most of these individuals who have immigrated or were forced to flee their home countries, are fully capable human beings who just need resources and help from others in order to get back on their feet and be self-sufficient. Although my heart goes out to those we worked with and their oftentimes tragic pasts, I have come to realize that they have been through so much already that their current realities and their future experiences are probably nothing in comparison to where they’ve already been and what they’ve already experienced. Obviously hardship will fall upon us all and they are no exception, but I definitely have a new perspective on all of this, for which I am grateful. I know going forward that things will fall more into place and will get better, I just have to be patient and take care of myself in the process. I look forward to finishing my degree this Spring Quarter and going out into the workforce to help those in need by providing them with resources and empowering them to be self-sufficient in order to build the life they’ve always wanted. Our study abroad program here in Alghero, Sardinia, Italy has focused on migrant, refugee, and marginalized populations. One of the organizations we’ve been working with is a camp referred to as Vel Mari, an old waterfront hotel that houses individuals fleeing war-torn countries and/or other dangerous circumstances. One of the biggest hurdles that residents living at Vel Mari face is finding and securing a job in their new country of citizenship. In order to legally work in their new place of residency they need to have their documents first, which can sometimes take up to a couple of years to obtain, depending on the seriousness of their case and on their ability to prove the circumstances they are fleeing from. Additionally, for many of them, the local language is not their first and oftentimes their native language is drastically different than that of the country they are now living in, making it difficult for them to integrate into their new surroundings. While staying at Vel Mari individuals are taught Italian, as it is necessary in order for them to find work, but this attempt is futile for those who are uninterested in staying in Italy and want to resettle in a different country. An example of this is a young man staying there who is originally from Eritrea but made the journey to Italy by way of Sudan and Libya. He has lived at Vel Mari for over a year and although he has all his documents, he stresses the lack of available jobs and how frustrating it is to essentially be stuck in Alghero with no opportunities. He has expressed interest in traveling to Germany, France, or the United Kingdom in search of better options, but he has stated that it is difficult to travel elsewhere because you need money and you can’t get money without a job! Even for those who wish to stay in Italy and learn the language enough to speak it fluently, the reality is that there are minimal to no jobs available for them to take. Alghero, while being a more open and accepting community for refugees and migrants compared to many other places, is still a smaller city with its own economic hardships, some of which might be due to the limitations of seasonal-work, as well as the recent removal of Ryanair flights bringing tourists and other people to the island. 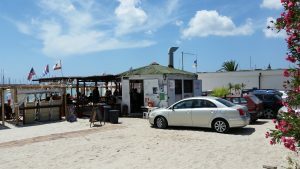 Another factor people staying at Vel Mari have to deal with is the public’s perception that they are lazy or unmotivated to find work, are just seen as roaming the streets of Alghero, and that they are not contributing to the local economy or society as a whole. The problem with this perception is that it is steeped in ignorance, as the community is unaware of (or is unwilling to learn) the truths behind their presence. The reality is that they are willing to work hard and integrate more into the culture, but they are literally unable to do so with the lack of available jobs. Residents of Vel Mari are no different than most other adults trying to make ends meet in life, as in they want to be self-sufficient and not have to take hand-outs from other people, but this is only possible if they are receiving an income to be able to pay rent, have transportation, and afford other expenses. 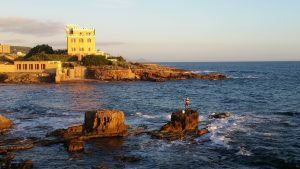 I write to you from the coastal town of Alghero, Sardinia, an Italian island west of the mainland. This place is beautiful and the Mediterranean Sea is a gorgeous mixture of blues and greens. The white sandy beaches and crystal clear water are lovely to gaze at whether it’s day or night, and the sunsets here color the sky with pink and amber tones. The weather has been consistently hot, usually somewhere between 85 and 90 degrees, but at times has reached closer to 100. When I first arrived here the weather was unbearably hot for me, especially given that I was born and raised in mild, rainy Seattle! I had a rough time in the beginning acclimating to the heat and to my surroundings in general, but with some self-care and lots of Powerade I was able to nurse myself back to better health, which allowed me to explore and participate more in activities instead of just hiding in my hotel room. Prior to coming here, we knew that our program would focus on migrant and marginalized populations, but what all that would entail wasn’t set in stone. At home I need structure to be more productive and successful, but in terms of my general attitude towards life, I tend to be more go-with-the-flow. This trait has been very beneficial because Italian culture is much more relaxed and fluid than back home in America, and sometimes plans fall through or activities start or end at different times than what was anticipated. There’s a running joke about “Italian time” and how it’s kind of its own thing, so when you’re here it’s just best to try and adapt and make the most of it, instead of getting upset or really worried about it. It seems to me that people here are really understanding of schedule changes and unexpected situations that crop up. Here is a little taste of the landscape I get to see on a daily basis (and yes, that’s a man fishing from a rock in the middle of the water!). In the next couple of blog posts I will get into more detail as to what our program focuses on, what our activities are, and how we’re interacting with the local community. Ciao for now!